TwistedBrush Pro Studio est un logiciel de dessin et éditeur photo numérique avec des outils artistiques naturels. L'offre gratuite du jour pour TwistedBrush Pro Studio 17 était valable le 4 octobre 2012! Un logiciel de dessin et éditeur photo numérique avec des outils artistiques naturels. TwistedBrush Pro Studio possède l'un des moteurs les plus complets et les plus performants, mais à pourtant été conçu pour être facile d'utilisation. Non tu n'as pas besoin de compte facebook, tu vas sur la page indiqué dans le readme. sur celle-ci tu as le code et le name. apparemment pour avoir la licence il faut avoir un compte Facebook...( ou je n'ai rien compris a ce qui était sur la page de validation de licence ... ce qui n'aurais rien d'étonnant non plus) mais comme je n'ai pas de compte facbook .. et qu'il est hors de question que j'en ai un .. je ne peut que voter mauvais. un deuxieme point négatif le logiciel ne semble être qu'en anglais .. Seems like Twisted Brush v17 was offered about 2 months ago. TB is a super photo editor packed with a ton of features. You can easily add awesome special effects that are a pain to imitate in Photoshop. That's what I like best about TB. TB is easy to use...but it has a steep learning curve...thanks to the huge variety of features. Every time I use TB, I learn something new. WARNING: TB v17 works poorly in Windows 7 x64. TB v17 is XP software (and v18 for Vista). But TB v19 works great in W7 x64. I upgraded to v19 for that reason. Last time, the developer offered a cheap upgrade price for the GAOTD community. If you like TB, the upgrade to v19 is well worth it. BTW, the developer regularly updates v19. A minor update for v19 was released a few days ago. Creates Awesome Special Effects Seems like Twisted Brush v17 was offered about 2 months ago. TB is a super photo editor packed with a ton of features. You can easily add awesome special effects that are a pain to imitate in Photoshop. That's what I like best about TB. TB is easy to use...but it has a steep learning curve...thanks to the huge variety of features. Every time I use TB, I learn something new. WARNING: TB v17 works poorly in Windows 7 x64. TB v17 is XP software (and v18 for Vista). But TB v19 works great in W7 x64. I upgraded to v19 for that reason. Last time, the developer offered a cheap upgrade price for the GAOTD community. If you like TB, the upgrade to v19 is well worth it. BTW, the developer regularly updates v19. A minor update for v19 was released a few days ago. Well, after Zoner Phone Studio I wouldn't expect another excellent GAOTD like this one.... great job GAOTD team...keep going like this!! I think I'll pass on this, because I recently took advantage of another amazing FREE offer concerning the EXTREME version of award-winning XARA software, but for sure today's giveaway is a must have tool for painters, artists, (web) designers and just ordinary people who loves drawing digital images and sketches with their own PC. 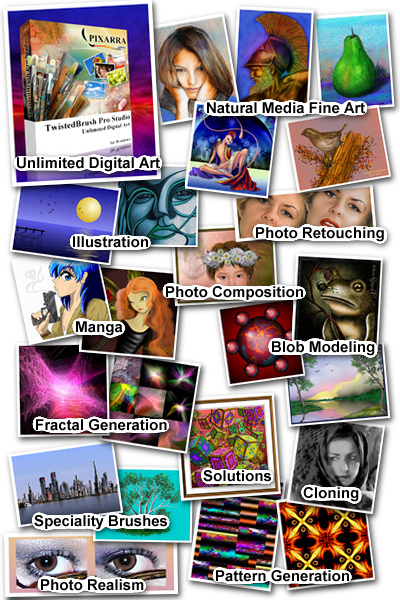 In fact it sports an impressive array of layers, realistic media, photo cloning tools, filters and over 5000 brushes. Definitely one of the BEST digital pianting tools on the market right now along with XARA EXTREME EDITION and a few others. A huge THUMBS UP from me, although this is NOT the last and updated version of this program (v 19)!! Amazing 3D modeling, animation, rendering and video post-processing Open Source App. Definitely NOT for noobs. Well, after Zoner Phone Studio I wouldn't expect another excellent GAOTD like this one.... great job GAOTD team...keep going like this!! I think I'll pass on this, because I recently took advantage of another amazing FREE offer concerning the EXTREME version of award-winning XARA software, but for sure today's giveaway is a must have tool for painters, artists, (web) designers and just ordinary people who loves drawing digital images and sketches with their own PC. In fact it sports an impressive array of layers, realistic media, photo cloning tools, filters and over 5000 brushes. Definitely one of the BEST digital pianting tools on the market right now along with XARA EXTREME EDITION and a few others. A huge THUMBS UP from me, although this is NOT the last and updated version of this program (v 19)!! BEST FREEWARE ALTERNATIVES * Blender (==&gt; Softpedia Editor Pick) Amazing 3D modeling, animation, rendering and video post-processing Open Source App. Definitely NOT for noobs. http://www.blender.org/features-gallery/ * (Portable) Gimphoto This is a GIMP modification supercool tool with additional plugins and resources to bring the best GIMP experience to Photoshop users. More than 100 brushes available for artists: http://www.gimphoto.com/2007/08/features.html * (Portable) Inkscape (==&gt; Softpedia Editor Pick) Awesome Open Source vector graphics editor, which uses the W3C standard Scalable Vector Graphics (SVG) file format http://inkscape.org/ * PictBear Terrific highly functional and easy to use paint software with a vast range of brushes available to use for FREE http://www.fenrir-inc.com/us/pictbear/ * Project DogWaffle Free Edition http://www.dogwaffle.info/dogwaffle/free/index.html * ArtRage Starter Edition http://www.artrage.com/artrage2-features.html * ArtWeaver http://artweaver.de/products-en/artweaver-free/ * Speedy Painter http://speedypainter.altervista.org/ * (Portable) PIXIA http://www.ne.jp/asahi/mighty/knight/ http://www.softpedia.com/get/PORTABLE-SOFTWARE/Multimedia/Graphics/Windows-Portable-Applications-Portable-Pixia.shtml * Sumo Piant Great online image editor and drawing application http://www.sumopaint.com/features And as PHOTO EDITORS only.... * (Portable) Hornil StylePix (==&gt; COOL lightweight app) http://hornil.com/en/products/stylepix/Features.html * Portable RealWorld Paint 2011.1 http://www.rw-designer.com/image-editor * Paint.net http://www.getpaint.net/ * Funny PhotoMaker http://www.funny-photo-maker.com Enjoy!! But the registration information is displayed on the page. There is no need to enter an email address. You can enter your email info to receive support, upgrade offers, etc. But this is optional. A very nice practice that I hope other publishers will pick up on and begin to use. As for the program itself, I will admit I am not much of an artist but I had fun trying the program. I am sure with time I can produce some thing worth saving. For those that like to create, look no further. I don't think you well find such a well rounded program anywhere. I would urge you to try it and to also visit the publisher's web site. You may want to join in on their community and contribute your creations. Thank you GAOTD team for your efforts. thank you to the publisher, Pixarra Inc., for your offering. This is an easy install and registration. You must visit this page: http://register.pixarra.com/TBPS_V17_GAOTD_reg.htm But the registration information is displayed on the page. There is no need to enter an email address. You can enter your email info to receive support, upgrade offers, etc. But this is optional. A very nice practice that I hope other publishers will pick up on and begin to use. As for the program itself, I will admit I am not much of an artist but I had fun trying the program. I am sure with time I can produce some thing worth saving. For those that like to create, look no further. I don't think you well find such a well rounded program anywhere. I would urge you to try it and to also visit the publisher's web site. You may want to join in on their community and contribute your creations. Thank you GAOTD team for your efforts. thank you to the publisher, Pixarra Inc., for your offering. 1. The license key can be found on the page that was included in the readme.txt file. 2. Updates to version 19 will be offered at the standard upgrade price. This information will be sent in email on the following day. Be sure to register your email address if you want the option to upgrade. 3. Version 17 does result in Windows Vista and 7 switching out of Aero themes. This is functionally controlled by Windows but is temporary and has not adverse effects. Later versions of TwistedBrush have resolved this limitation. Unfortunately virus scanners are often too aggressive in their protection and report false positives. You can submit the file in question to the virustotal.com website to have it checked against most known virus scanners. Once you are happy that the file on your system is OK you can adjust your virus scanner to accept it. Additionally as a user of the anti-virus software you can submit your findings to the company as a false position so they can make corrections to their software or virus definitions. 5. If unable to access the pixarra.com domain. Best to check with your ISP to enable access. They might be blocking access to parts of the web that you want. However feel free to email support@pixarra.com if you are not able to access pixarra.com to get the license information. 6. You do not need to be connected to the internet to run TwistedBrush. 7. Uninstalling removes files with the exception of the license keys stored in registry and files created after the installation. 8. Windows 7 X64 is fully supported. Thanks for those who commented here and placed reviews, good or bad. It helps users make an informed choice! Feel free to visit the forum at http://forum.pixarra.com or email kcarlino@pixarra.com as well.